Have you ever wanted to add in extra images or have multiple photos in a single Instagram story? Or add a specific GIF you can’t find in Instagram’s GIF Library? This is a super simple and quick way to get an extra photo or GIF onto your Instagram story post. All you have to do is copy a photo from your camera roll and then paste it onto your story using the text tool! Start by opening a photo and tapping the “export” button. Now tap “Copy” and head back to your Instagram story. Double-tap the screen to pull up the “Paste” option. And that’s it! The photo you copied earlier should now appear on your story. The second option is to download Google’s Gboard app and paste photos directly from your keyboard. To do this, simply open a story, and tap the screen to pull up the Gboard. Now tap the “G” Google logo and type a query into the search bar. You can sort your search to include images and GIFs. Once you find what you’re looking for, simply tap the image or GIF to copy it, and then tap the screen once to paste it! Just remember to check the usage rights or credit the image where needed. What’s great about this Instagram Stories hack is that there are so many use cases. For example, if you’re re-sharing an Instagram post to your stories, you can paste a rectangle onto the story and then place it behind the post to create a framing effect. Or if you’re trying to add your brand colors to a story, you can paste an element that contains the colors onto your story (like a graphic or logo), and then use the color dropper tool to pick up the exact color from that element. Did you know that you can turn your live photos into Boomerangs in Instagram Stories? Simply open Instagram Stories, swipe up, and pick a live photo from your camera roll. Once selected, press firmly on the screen for a few seconds until you see the word “Boomerang” appear briefly. And that’s it! You’ve now turned your shot into a Boomerang! Instagram Stories offers a bunch of great fonts, but nothing beats having your own brand font! If you’re looking to add a little more “brand” to your stories, writing in your brand font is a great option. And luckily, there’s a way to do it. Start by downloading the Over mobile app. Once downloaded, AirDrop your font’s .OFT file to your mobile device. Select Over from the menu that pops up. And that’s all. Now when you design a story in Over, you’ll be able to incorporate your brand fonts! Looking for more ways to create Instagram Stories that match your branding? Check out our free video workshop on how design captivating Instagram Stories using the popular design app Over! Instagram collects a ton of great data around your Instagram post’s performance, like the number of impressions, saves, follows, and more. But there’s one piece of data you might be missing out on: story reshares. You won’t find this in your Instagram Insights. Instead, you’ll need to tap the ellipsis in the top right corner of a post to pull up a menu with the option to “View Story Reshares”. This will take you to a screen with a list of your current public reshares. You can even tap one of the reshares to see it live on the user’s account. If you don’t see the option to see reshares, this means that your post isn’t currently being shared in anyone’s stories! This can be particularly useful if you’re looking to share user-generated content on your Instagram Stories! For example, if you’ve just launched a new product, you might want to reshare how your followers are reacting to your big announcement! A few of the font styles in Instagram Stories lack the option to be left- or right-aligned, which can be a bit of a nuisance. Usually, you can just tap the alignment button in the top left corner of the screen to change your text’s alignment. But if the button is missing (which is the case for the Modern, Neon, and Strong fonts), your text will automatically appear centered. Luckily, there’s an easy solution! Simply type a message in Instagram Stories with a font that doesn’t have the alignment button. Now swipe a finger left or right on your text. This should change the text’s alignment. Instagram Stories is a great place to show off your brand’s personality, but it’s also really important to reflect your brand’s style, tone and aesthetic. And one of the easiest ways to do this is to integrate your brand’s color palette. But what if Instagram doesn’t offer your brand colors in its default color options? Lucky for you, there’s a hidden Instagram Stories hack that lets you access every color you could need for your text! All you have to do is open your Instagram Stories and select the brush tool. Now tap and long-hold any of the default color options at the bottom of the screen to open the color slider. Now just swipe across the slider to pick a custom color for your story. Similarly, if you’re using an Instagram Stories template that you’ve designed with your brand colors, you can use the color picker tool to pinpoint the exact brand color from your template! Looking to get started with using Instagram Stories for your business? Check out our free 45-minute video course on how to design beautiful Instagram Stories that will help you get more followers, traffic, and sales! If you really want to make your text design even more impressive, you can use the color picker tool to create a color gradient (or rainbow) effect with your text! To do this, open Instagram Stories and type out a message. Then tap on your text and tap “Select All” to highlight it. While your text is highlighted, press and hold one finger down on the color palette tool at the bottom of your screen (like you did before) to open the entire color spectrum. With one finger held down on the color slider, and one on your highlighted text, begin to drag both fingers toward the left side of your screen at the same time. You’ll see your text begin to change color, letter by letter, as you drag your finger across the color spectrum! You can move your finger faster or slower for additional color variations, or alternate the direction that you drag your fingers across the screen to achieve an entirely different result. Sometimes the simplest Instagram Stories hacks are the most fun! If you’ve ever wanted to make your emojis really stand out on Instagram Stories, there’s a hidden trick to give them a glow effect. To do this, simply open your stories, tap the screen to open the text tool, and select the Neon font. Now when you add an emoji, it should have a slight glow behind it! Tap the pen icon in the upper right-hand corner of the screen and select a color. Next, tap and hold on the screen for 1-3 seconds until the screen is filled with a solid color. If you want to take this Instagram Stories hack a step further, you can use the eraser tool to create a sort of “scratch card” effect that’s perfect for reveals! For example, if you’re teasing an upcoming campaign or even a new blog post, you can paint your screen with the brush tool and then use the eraser to share a few details about what’s to come. Open Instagram Stories and take a photo or upload one from your camera roll. Once your photo is in, tap the pen icon in the upper right-hand corner of the screen and select a color. Next, tap and long-press the screen for 1-3 seconds until the screen is filled with a solid color. Tap the eraser icon on the upper right-hand corner of the screen and select the size of the eraser using the slider on the left-hand side of the screen. Now tap or swipe on the screen where you would like to reveal the underlying image. And that’s it! 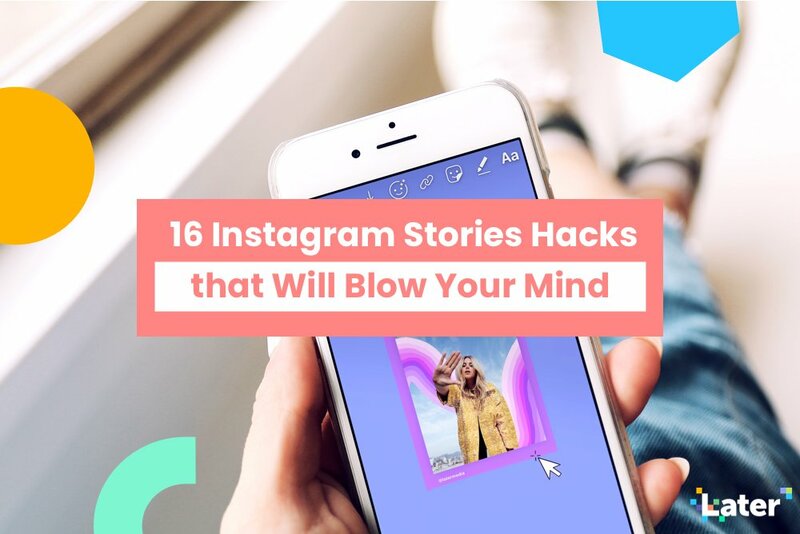 If you’re looking to entice your audience and share just a tiny highlight of your story, this Instagram Stories hack should come in handy. Sometimes hashtag stickers can ruin the aesthetic of the Instagram story you want to post, but thankfully there are ways around it. If you want to hide hashtags in your Instagram Stories, type out your hashtags (you can include up to 10 in your stories), and then pinch them to make them smaller. Now place a GIF or image sticker over the hashtag text so it’s perfectly hidden! Or you can select the color tool from the text option and choose a color that perfectly matches your Instagram story background (this works a lot better if the background is a solid color). With just two taps, your hashtag content will magically blend into the background but still be searchable! Keep in mind that if you make the hashtags too small, Instagram won’t register them! So the best way is to camouflage them with the background or hide them behind another design element. Sometimes the smallest design details can have the biggest impact. If you’re looking for an easy way to add a little flash and pizzazz to your Instagram Stories, you could try adding a drop shadow effect to your text. Open your stories and tap the screen to pull up the text tool. Write your message, choose your font and resize by pinching your fingers. Repeat these steps again with the exact same message font and size, but in a different color! Now simply arrange the top layer of text so that it’s slightly off-center from the bottom layer of text, and that’s it! The Instagram Stories question sticker has gotten a lot of love from businesses on Instagram — they’re a great way to show your followers that you’re approachable there’s a real human behind your account. You can ask for advice or give your viewers the chance to discuss their thoughts — whatever helps you engage with your audience on a deeper level. For example, if you’re planning a live broadcast or an Instagram Stories takeover, you can use the question sticker to gather your audience’s most pressing questions beforehand. The only drawback is that you can only share one question sticker per story, meaning that if a ton of people wrote in, you may need to create 10+ stories to share them all. Luckily, there’s an easy workaround! Simply create a story where you share a response to your question sticker. Now take a screenshot and exit out of the story. Now open that screenshot you just took and create a second story using a different question sticker response. Keep doing this until you have multiple question stickers on a single story. And that’s it! Your followers will thank you for saving their thumbs some tapping! Did you know that instead of just layering design elements on top of your Instagram Stories, you can actually pin text, stickers, emojis, and GIFs into your videos and boomerangs — so they show up at the perfect moment? By pinning creative elements into your Instagram Stories videos, you can surprise your viewers and keep them engaged! To do this, simply record your video then add a creative element like text, a sticker, emoji, or GIF. Now tap and hold the element that you added. Use the slider bar at the bottom of the screen to scroll through the video to find where you want to pin your creative element. Instagram’s collaboration with GIPHY has been a huge win for businesses and Instagram users alike. But there’s actually another way to add GIFs to your stories: using the GIPHY app! If you’re on the GIPHY mobile app, pressing the Instagram icon located under any GIF will automatically open Instagram. Now you’ll see a screen with two options: add the GIF as a post to your feed or add the GIF as a story. You may be wondering why this is useful. Well, unlike Instagram Stories where you can only search for (and obviously post) GIFs, on GIPHY you can create albums of your favorite GIFs and then easily share them when the time is right. Basically, this makes it easier to be “intentional” and forward-thinking with the GIFs you share. If you’ve been looking for a way to create your own GIFs for Instagram Stories, look no further. ImgPlay is the easiest way to create GIFs using photos and videos right from your camera roll! ImgPlay lets you cut portions of your video, or select multiple photos to create a slideshow or GIF. You can also edit existing GIFs from your device using the app. Once you’ve created your GIF, you can change the playback speed and duration, and also add text, filters, and other customizations using the icons in the bottom bar. Once you’re done, simply upload your new GIF to Instagram Stories! It’s a simple trick that so many brands and businesses don’t utilize! If you have a special product launch, or event announcement coming up, you want to make sure you’re targeting your audience when you know they’re most active online! And by scheduling your Instagram Stories posts with Later, you can use your analytics to plan, schedule and post at the perfect time. For example, Later recently released a free Social Media Monthly Report Template. So ahead of the release date, we scheduled our Instagram Stories to go live to coincide with our blog post, newsletter and our best time to post on stories! Planning and scheduling Instagram Stories posts takes just a few minutes and it can all be done from your desktop. When the time comes to make your Instagram Stories live, you’ll receive a push notification to your phone and with just a few taps on your mobile, you’ll be able to share your posts with your followers. Ready to start scheduling your Instagram Stories posts? Later’s Instagram Stories scheduler is available now on all paid plans, starting at $9/month. Upgrade now to get access or start scheduling stories! If you want to add a simple colored box to your story, you can do it by programming a text replacement on your mobile with a keyboard shortcut. If you create a keyboard shortcut that consists only of spaces, you’ll be able to apply a background color to the spaces (as Instagram will still read that as text when you choose your font) but it will appear as a plain, colored box in your post! Tap the “+” button in the top right corner and then paste the space in the “Phrase” section. You can then name your shortcut. Now head back to Instagram Stories and tap the screen to open the text tool. Type your shortcut and then select the text replacement. Now highlight the text and add a color from the options at the bottom of the screen. And voila! You now have a colored box that you can place behind your text! Given the number of updates and new features on Instagram Stories in the past few months, it can be difficult to stay on top of all the cool features at your disposal. Hopefully, these Instagram Stories hacks help you create some fun, artistic, and creative Instagram Stories that set you apart from your competition! Ready to go one step further and use Instagram Stories as part of your marketing strategy and grow your following? Check out our free video guide to Instagram Stories for Business in 2019!